Benjamin Franklin & Alma 37:6 — Small & Simple Everyday Things! Two facets of the same subject: First, I love this quote by Benjamin Franklin. 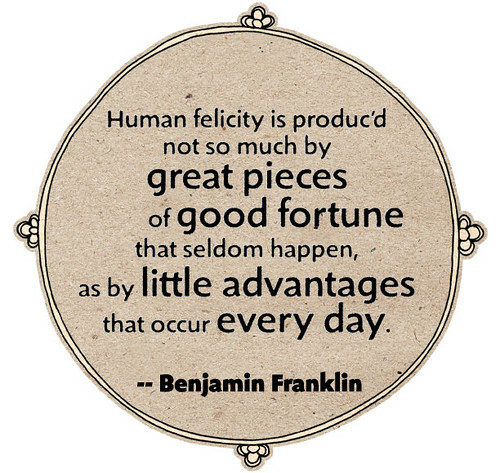 “Human felicity is produc’d not so much by great pieces of good fortune that seldom happen, as by little advantages that occur every day.” Secondly, it made me think of one of my all-time favorite scriptures. Alma 37:6 “Now ye may suppose that this is foolishness in me; but behold I say unto you, that by small and simple things are great things brought to pass; and small means in many instances doth confound the wise.” When we study that concept in seminary, I always try to warn my students that the reverse is also true: small and simple things can lead you down the path of spiritual destruction as well — those flaxen cords! But, mostly, I love this scripture for its acknowledgment in the great power of simple choices made repeatedly over time. Strength truly is consistency over time — whether it’s food, exercise, spirituality, or another choice. I love when quotes from unrelated parts of the world combine to affirm a universal truth!